We are a contemporary art collective. We make art installations, public art and plant fruit trees in public space for everyone to share. Fallen Fruit invite you to experience your City as a fruitful place, to collectively re-imagine the function of public participation and urban space, and to explore the meaning of community through creating and sharing new and abundant resources. Fruit Trees! Our Creative Capital project, The ENDLESS ORCHARD is up and running! Join us! Donate HERE. Our cities could be like communal gardens. What if instead of going to the grocery store for an apple, you just walked outside your door? Join us! The ENDLESS ORCHARD is a way that anyone anywhere can PLANT, MAP, AND SHARE FRUIT! 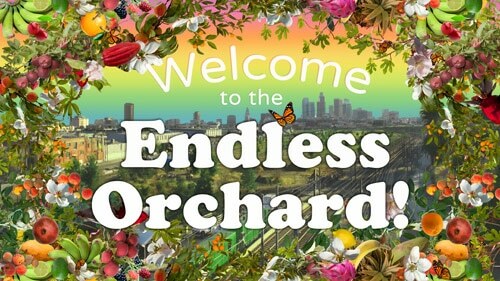 The Endless Orchard is a real living fruit orchard planted by the public, for the public – a movement of citizens transforming their own neighborhoods. Fruit is a transcultural symbol of sharing and Citizens can plant fruit trees in front of their homes, community centers, schools, businesses, on the margins of public and private space and interstitial municipal spaces like parkways , bike paths and alleys. The ENDLESS ORCHARD (endlessorchard.com) is free to use. Anyone, anywhere, can plant a fruit tree along their property’s publicly accessible margins and map it on the Endless Orchard. With each new tree, the orchard grows larger and is shared with more people. Map trees that exist in public space in your neighborhood, or plant trees in collaboration with cities in public spaces and parks.